Markdown is a lightweight markup language with plain text formatting syntax. Markdown is often used to format readme files, for writing messages in online discussion forums, and to create rich text using a plain text editor. There are many Markdown editors, refer to this article, The 10 Best Markdown Editors of 2018 to get a list of popular Markdown editors. As a programmer, you may be already very familiar with Intellig Idea, as a powerful code editor and IDE, but what you may not be aware, is that, it is also a great Markdown Editor! What is cool about Intellij Idea’s Markdown editing feature is that, it offers a visual feedback along the way you edit it. 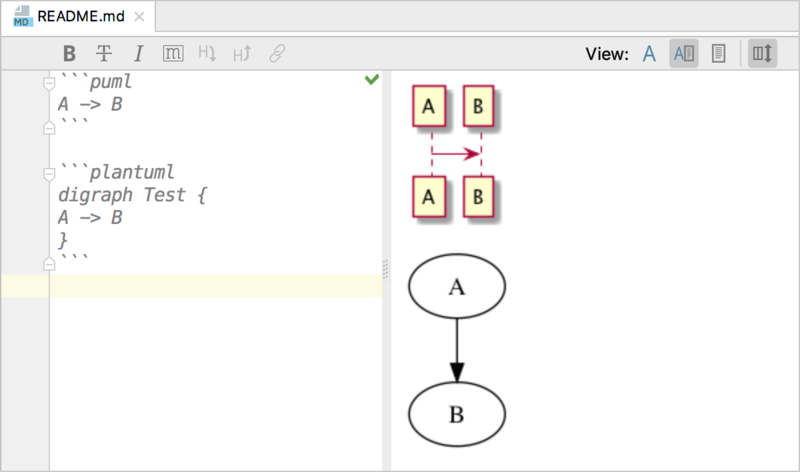 On top of that, IntelliJ IDEA even supports visualizing diagrams in the Markdown and preview it using the DOT and PlantUML diagramming languages. For programmers, you may frequently wish to insert fenced code blocks for different languages, this can be done by placing triple backticks (“`) before and after the code block, it is a breeze! Intellij Idea offers free community Edition and for students, there is also free Educational license! Enjoy that and make your life easier! In this series of articles, ramda functions are going to be explained in an intuitive ways so that usage of Ramda is straightforward. The 1st article of this series is on lens or a family of functions related to lens. First let’s ask a simple question, why is the function named “lens”? Understanding why is important, it makes one easily recall which function to use in ramda, without referring to the doc again and look for a candidate function among hunderds of them. Lens make it focus, full stop. With lens, you do not see the whole picture, but parts of it, yet with much more details. That fully describes what lens is. Analogous to this, if you have a very large amount of data, but your interest is not on the whole data set, but parts of it, and you want to manipulate it, read, write, delete …… That is where lens come into play. With this understanding, you will never forget what lens is! Here, lensIndex(0) tells us we are using lens to focus on the first element, that is it. But hold on, we know lens allow you to view the object, but lens is not the object it self! That is why we have a related function view, which returns the element itself. Emmmm, I can easily do the same thing as below, why bother? To recap, you can use lensIndex, lensProp and lensPath to locate the data of interest, this is analogous to use a lens to focus on specific fields. And then you can use view, set to read/write the values. ‘vue’ is not recognized as an internal or external command, operable program or batch file. I searched for a few placed in the internet, and many recommended adding the path where vue is installed, e.g. cd "$(xcrun --sdk iphoneos -- show-sdk-platform-path)/DeviceSupport"
Re-run the app, now it works like a charm. Vuforial is a widely used AR toolkit, and if you use it for some time, you will find “Delayed Initialization” for sure. You would like to try it, right? Vuforia cannot be started before it is initialized.Please disable Delayed Initialization in the Vuforia configuration or initialize Vuforia manually with the VuforiaRuntime-class. What hell does this mean? After a quick search on the internet, we found the solution: it turns out that the terminal (Mac) or the command line window is running for quite some time, and for unknown reasons, some of the information is outdated, which results in the captioned errors. That is it! Happy coding!